Red Maltipoo puppies are kinds of rare Maltipoos. Compared to all of the possible Maltipoo colors, red is one of the most rare. This one is seen even less often than a brown. According to the official website of Pet Maltipoo, the red Maltipoo and the black are the named as two most difficult colors to get when breeding. Are you interested in Red Maltipoo puppies and want to take care of one? If the answer to the question is yes, then it is time for you to look for Red Maltipoo breeders. Before looking for one somewhere, please try to look for the local. Looking for the local breeder is recommended for a lot of reasons. Aside from the fact that you can visit the breeder directly and pick up the puppy by yourself, the puppy also will not be exhausted from driving or flying too long. In order to help you in looking for the local breeders that offer Red Maltipoo, there is a site called the Local Puppy Breeder. This one has the complete list of every single local breeder that have identified in a certain state. 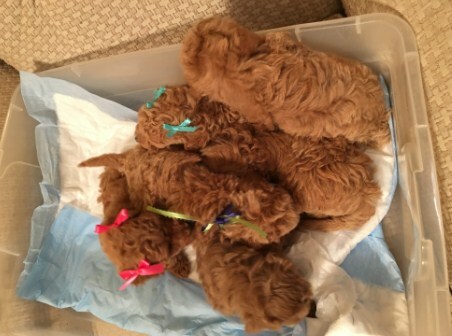 In the site, you will be able to find all the current contact information, as well as the link to the official website of the breeder, so you will be able to see what Red Maltipoo puppies are available for sale. When you are in the homepage, all that you have to do is to select the state and the breed that you are looking for. Some of the Maltipoo breeders recommended by the Local Puppy Breeders are Paddington Pups (Snohomish, WA), Jaco Kennels (Hulbert (OK), Paws N Tails Pups (Sallisaw (OK), Mel’s Maltipoos (Wayne (OK), Puppy Heaven (Agoura Hills, CA), Delceluz (Temecula (CA), Princess Pet Celebrity Dog Breeder (Los Angeles (CA), CS Puppies (Donna, TX), Tinny Tots Texas (Leander, TX), Texas Teacup Puppy (Dallas, Texas), and Fischer Kennels (Mountain Home, TX), Vicky;s Toy Puppies, Sherry’s Maltipoo, and many more. Vicky’s Toy Puppies is the one that based in Texas. This breeder does not have the system to hold the puppies until the total payments are made and nor will the owner replaces he puppy on hold “without” the agreed “non-refundable” deposit. For those who are living in Georgia, Sherry’s Maltipoo might be your best option. Sherry’s Maltipoos is known as the breeder that offers Maltipoo puppies (including Red Maltipoo puppies) for sale across the United States. This one breeds Maltipoo puppies that are healthy, loving, smart, and pre-spoiled. Sherry’s Maltipoos is located in Fitzgerald, Georgia (MAP). The location of this breeder is 100 miles south of Macon, Georgia and 100 miles north of the Florida line. The team lives in the country on 7 acres where the adult dogs have plenty of room to run and play and get the plenty of exercise. All of the dogs are not kept in the kennels. For a Red Maltipoo, the cost ranges from $1,000 to $1,500 for female or male. There is also a non-refundable deposit of $200 that you have to pay.